A plane flew over Chicago displaying the message, “Stop sexual harassment!” aimed at McDonald’s headquarters on Sept. 18. That day, workers employed by the fast food chain engaged in a historic strike in 10 cities to protest workplace sexual abuse. 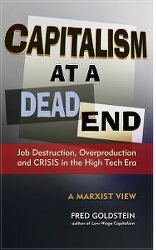 They marched and rallied in Chicago; Durham, N.C.; Kansas City, Mo. ; Los Angeles; Miami; Milwaukee; New Orleans; Orlando, Fla.; San Francisco; and St. Louis. 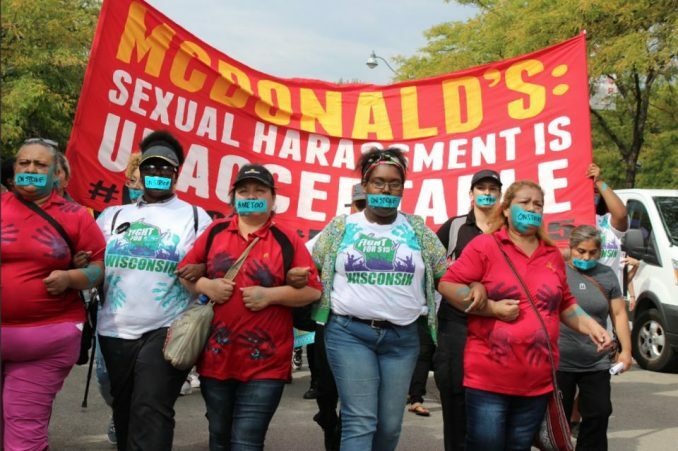 In many cities, the strikers carried banners that read: “#MeToo McDonald’s!” In Chicago and elsewhere, women put tape over their mouths on which the words “#Me Too” were written.” These courageous low-wage workers — the majority women, who are African American, Latinx and im/migrants — were fed up with rampant sexual harassment at the restaurants and staged the one-day walkout to tell McDonald bosses this abuse has to stop. They all took risks because they are not unionized. But they were backed by the Fight for $15 — a national campaign linked to the Service Employees union — which fights for a $15 minimum wage and unionization for all workers. This was their first such action against sexual harassment, say these brave workers. They plan to keep on demonstrating and pressuring McDonald’s — and they seek to inspire other service workers to boldly demand the right to work in a safe, abuse-free environment and be treated with respect.